This article is written by Lieuwe Jan Hettema, who comes from Netherlands, and currently is studying Master of Indigenous Journalism at the Sámi University College (Sámi allaskuvla) in Guovdageaidnu. He has written the article as part of his study and based on interview with me and some others in Guovdageaidnu. I am happy to present his work here, especially because he gives important information about the relation between mining and reindeer husbandry. I am also happy to publish the first article at gruve.info in English and the first in Dutch. So far we have articles in 4 languages, hopefully more languages will come. On the top of mountain Čáskejas, late September 2015. A neglected building reminds of the Biedjovággi mine. A once green area is transformed into a moonscape polluted with rusting waste. Against all expectations, in 2013, the Norwegian municipality Guovdageaidnu stopped the process of reopening a copper- and gold mine. It added a new chapter to the battle between external modern influences from outside and the traditional lifestyle of the Sámi, the indigenous peoples of Scandinavia and the Kola Peninsula. The reindeer storm in like gladiators into the arena. Antlers scrape against the wooden fence that encloses the small opening to the girdnu. The adrenaline pumps through the strong, energetic bodies. A reindeer slips in the mud and is overrun by others. Quickly it joins the herd again, nervously looking around, searching for the non-existent escape out of this small round area. For a moment, only the severe breathing of the reindeer is audible. With an intrusive shout a herder brings the herd into movement. The animals run around while keeping an eye on the people that stand in the middle of the girdnu. Along the side, other herders observe. Next to them are the youngest children, some elderly, and a lost journalist. We all stand numb on this drizzling October day, deep in the tundra on the Norwegian side of Sápmi: the land of the Sámi. A couple of older animals are grabbed by their big antlers and pulled towards the side. With a knife stab in the neck and one in the brains, their lives comes to an end in no time. While the muscles relax, the animal is dragged outside the fence, where it is immediately and precisely butchered. In this way, all of the animal, except for select organs, can be eaten or used by the families. Just as in other areas in Sápmi, this traditional method is still practiced here at Guorbavuopmi, in the herding district Ábborášša, by families that have lived here since time immemorial. The herd of Inga Susanne near the Biedjovággi mine, 1970’s. Marit Kristine's children help marking the reindeer calves. Inga Susanne Hætta Triumf grew up here. Together with four other families, her family forms one of the twelve siidas of Ábborášša: ancient-old co-operations of reindeer herders that share pieces of land with their herds. “These have been our autumnal grazing lands forever,” says Inga Susanne. She nods to the top of the mountain, where a partly asphalted road winds its way up. “Čáskejas used to be a nice place with a lot of green. 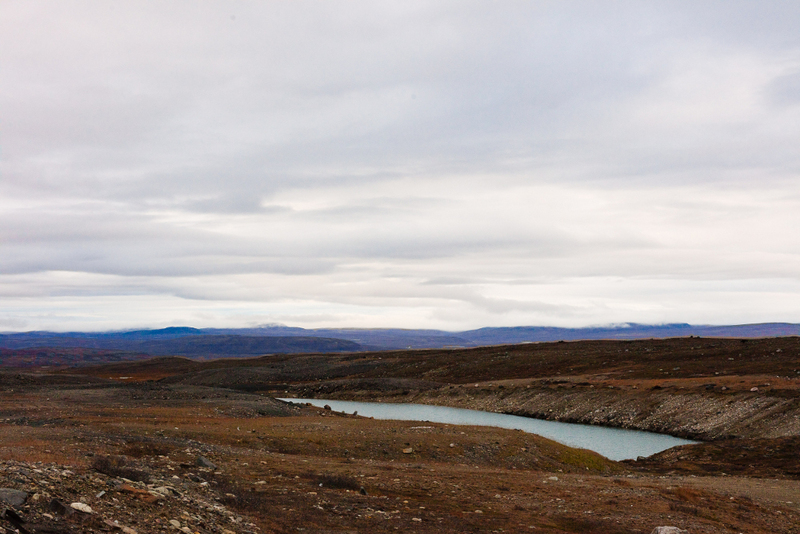 We drank coffee there while our reindeer grazed.” It once was a fixed resting point on the migration route. 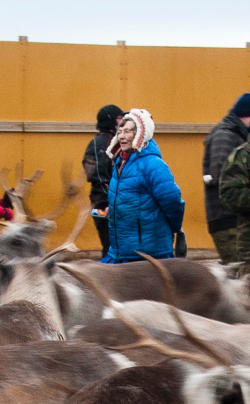 The 77-year-old reindeer herder remembers the arrival of the first mineral researchers in 1952 clearly. “The research started little by little, but it became more and more,” she says. Geological researchers of the Norwegian state stayed from 1955 until 1966 in this remote area. With bulldozers and tractors they brought tools and cabins from Guovdageaidnu (Kautokeino in Norwegian) to Čáskejas. She puts her hands deeper into her jacket pockets. The arrival of the researchers was a surprise for her. She did not know that a handy speculator, Gudleif Holmboe from Tromsø, had taken over the mining rights for a pittance. He bought the rights from some reindeer herders, after their discovered copper ore showed up under his eyes. Three years later Holmboe sold the rights for a multiple to the Norwegian state, pocketing 15 million Norwegian Kroner (roughly 1.5 million Euro) in today’s currency. The generosity of the state is in line with its interest in natural resources, which has made the country wealthy. Politics modernized for the North after 1945; new infrastructure came, industry was created and the assimilation politics to sculpt the sea-, river- and reindeer-Sami into modern Norwegians was intensified. All efforts were aimed at economic development and eradicating the old culture and traditions of the Sámi. 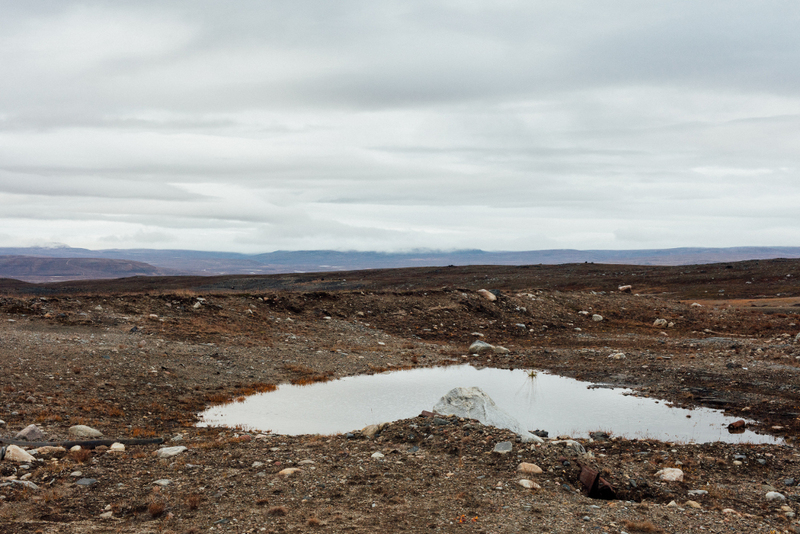 “Along the tractor road you still find waste from that first period,” tells Inga Susanne. On top of the mountain it is worse. “We cannot go there with the reindeer, everything is damaged.” This is a result of two short but intensive periods of copper and gold mining in the Biedjovággi mine, named after the valley behind the mountain. In 2013, the municipality council created a controversy by stopping the reopening of the mine due to, among others, cultural reasons. Experiences from the past played an important role. His interest in plants and picking berries brought Svein Lund to the fields around the mine in 2006. The 64-year-old former educator noticed a blue rash on some stones in the wetlands. “Streams had a strange colour as well and rusty iron pipes protruded out of the water,” he says. The last time he was on site was years ago and he got a job there. However, in 1975, just days before his first day of work, mining company Sydvaranger pulled the plug on the remote mine. Since the opening in 1968, the exploitation of the mine had only cost money. State owned Sydvaranger took over from the ailing Bleikvassli in 1973 under political pressure. Seven years earlier Bleikvassli had been the only interested company. The Danish owner Holger Fangel got all possible support from the state to make the mine a success. A forty-kilometre long asphalt road was constructed from Guovdageaidnu straight through the unsullied tundra. The company was provided with the data from years of research. The businessman argued that the land at the base of the mountain was better for reindeer. In 1974, a judge ruled differently and decided that Fangel had to pay 547 thousand Norwegian Kroner to Ábborášša and three other herding districts. The climate proved an even bigger problem. 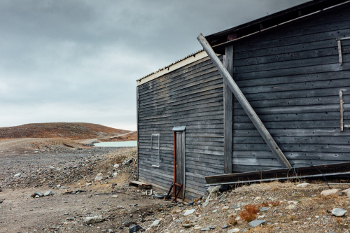 “Čáskejas is the most windy place on the tundra, which makes it feel even colder than it actually is; a hopeless location for a mine,” according to Svein, whose book Gull, gråstein og grums (Gold, granite and turbidity) about controversial Norwegian mines, was published this year. Water pipes froze, machines and other tools were unusable. On the coldest days the workers could not leave the buildings because of the extreme weather conditions. The majority of the year they could work, but the profits were not high enough: the mine was too focused on copper extraction. Even though they knew there were huge amounts of gold in the rock, they did not manage to actually extract it with the techniques of that time. The Biedjovággi mine did become a success after Outokumpu reopened it in 1985. 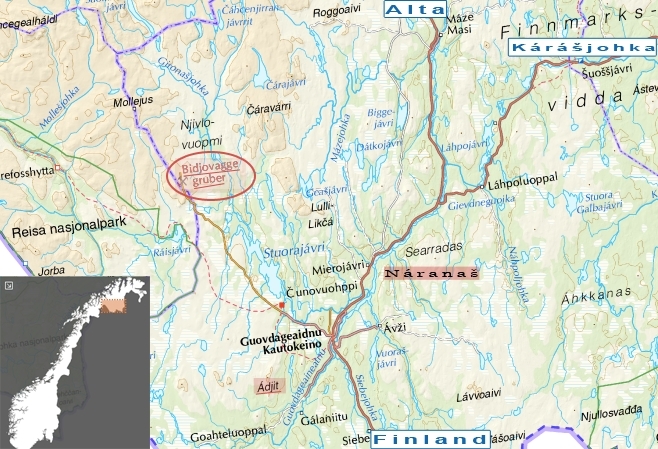 The Finnish state company used a method whereby much more gold was extracted. A small amount of the employees came from Guovdageaidnu and the mine also provided work for local companies. However, in total, it did not give much income for the municipality. Trucks drove in and out of Finland; everything of value left. 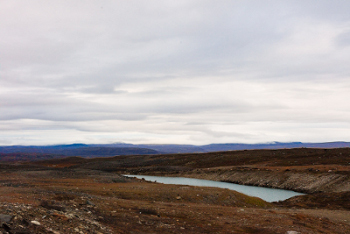 This painful memory resurfaced in 2013 when the municipality council had to decide if the Swedish company Arctic Gold would be allowed to offer the mine a third life. One of the former open-pit mines on Čáskejas. Reindeer in the girdnu of Guorbavuopmi. With great effort we avoid the big stones and deep holes on the steep road. The rear tires slip away in the gravel; the Volkswagen engine struggles. The jumpy view in the side-mirror is impressive: infinite green tundra with many lakes, streams and small birch trees peppering the landscape. In some places, the first snowfall of the season has not yet disappeared. In the west only the top of the sun is visible, and it bathes the horizon in a red-pink hue. The tires crunch in the frosted snow, which upon closer inspection resembles large salt grains. Off in the distance, the humming sound of an ATV is faintly audible. A neglected grey building stands behind the frozen lake on the flat top of the mountain Čáskejas. It is surrounded by rusted plates, broken electricity cables, and crushed rocks. Our shiny, red car stands out against the grey-white moonscape. Primarily, Norwegian and Finnish men worked in the mine. “Me and others that came from far slept in a weird, oblong flat,” he remembers. “Beyond there was a row of brand-new Mercedes cars, BMWs, you name it. An amazing view, those cars on the North Pole.” Tax benefits on new cars were a teaser for mineworkers by the Finnish authorities. 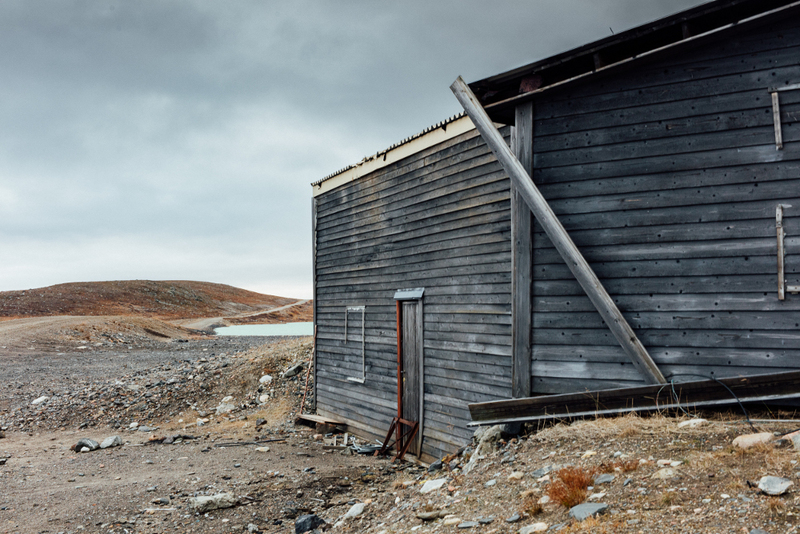 When a shift ended, a train of cars drove through the tundra, all miners leaving the remote settlement. There was little to enjoy for them around the mine. There are three other mines in the municipality of Guovdageaidnu: the closed mine of Ádjit where rusted machines set the scene, and the two mines of Náranaš. Some years ago the municipality financed a bridge to the Náranaš mines for 20 million Norwegian Kroner. It was believed that the international demand for greenstone would create employment. However, shortly after the construction of the bridge, both the international market and the cooperation between the municipality and the mining companies reached a nadir. Currently, one mine operates on a small scale. The traditional lifestyle is under pressure due to conflicts over land-use: it does not coexist with the demands of modern industry. It seems to be too late to preserve the lifestyle of the river- and sea-Sámi, since big fisheries rule along the coastline, edging out smaller, sustenance level fisherman. The future of the traditional lifestyle of ‘Norwegian’ reindeer-Sámi looks brighter, although the question of what the future role of reindeer herding and mining should be separates this community. The Biedjovággi mine for example, is still labelled as an industrial area. A proposal to remove this label does not seem to get a majority of votes in the municipality council. As a collective, the Sámi did manage to achieve political and cultural rights. Those rights were claimed and received in the aftermath of protests that started in 1979, rallying against the construction of the Alta dam, which threatened to make the town of Máze disappear. The results of the protests were the construction of a smaller dam that saved Máze, but the event also served as a catalyst for acknowledgement of Sámi rights in identity; tangible evidence of that struggle include establishment of a Sámi Parliament, university and theatre, all with funding from the Norwegian state. 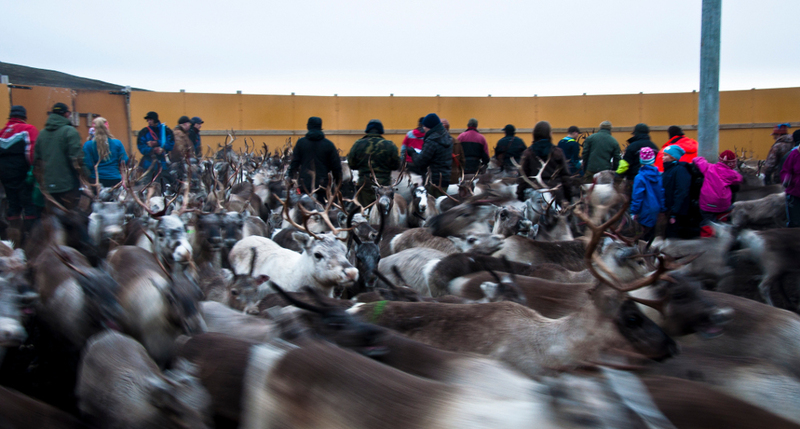 Reindeer have a central cultural, political and economical role in the municipality of Guovdageaidnu. The majority of the three thousand inhabitants is connected to reindeer herding in various ways. Some are registered as members of a siida and as ‘full time’ reindeer herders, while other herders are officially unemployed. Others have ‘modern jobs’ and are with their families’ reindeer herd when help is needed. 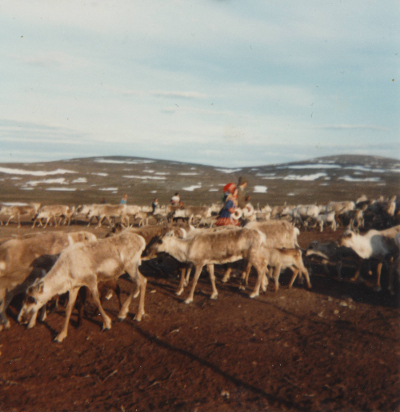 Besides employment, reindeer supply materials, such as for the Sámi duodji handicraft. Antlers are for example used in the construction of knives. It is questionable if a municipality with a structural deficit of 14 million Norwegian Kroner and the highest unemployment rate of Norway (7.2 per cent) can resist the on-going threat of mining projects. However, after the local elections in September, the Labour Party and Johttisápmelaččaid listu (the ‘Reindeer Herders Party’) agreed in their negotiations to rule out the reopening of the Biedjovággi mine until 2019. Afterwards, the whole circus may start again.